Killarney Celtic; Ryan Kelliher (4), Jared Barton, Liam Spillane . Ballyhar Dynamos; Jason Brennan and Jack Duggan . Killarney Celtic; Cian McMahon (2), Jack McCarthy, Adam May Keane , Paul O Sullivan. Fenit Samphires; Conor Gaynor, Liam Tobin(3), Eddie Stack(2), Gavin Burrows(3), Tommy Burns, Eddie McCarthy, Cormac Lynch, Eoin Higgins(2). Atletico Ardfert; Seanie Brosnan, Gavin Slattery and Ronan Casey Pierce. Castleisland AFC; Daniel Kelly and Adam Joy . Rattoo Rovers; Padraig Slattery (2), Aidan Boyle . Dingle Bay Rovers; Con Barrett, Joe Sheehy, Sean Fitzgerald. Listowel Celtic; Jojo Grimes , Ashley Kelliher , Micheal Kennedy . CG Killarney; John Foley , James McCarrick (2). Classic Fc; Derry Ahern (2) . Killorglin B; Jack O’Sullivan . Windmill United; Wayne Conway . St Brendans Park; Sebastian Vasiu, Padraig McCannon. 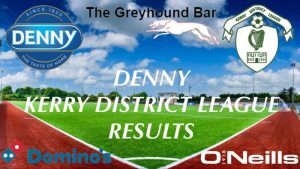 CS Abbeydorney; Stevie O’Sullivan (2), Mikey Clifford(pen), Shane Donovan.